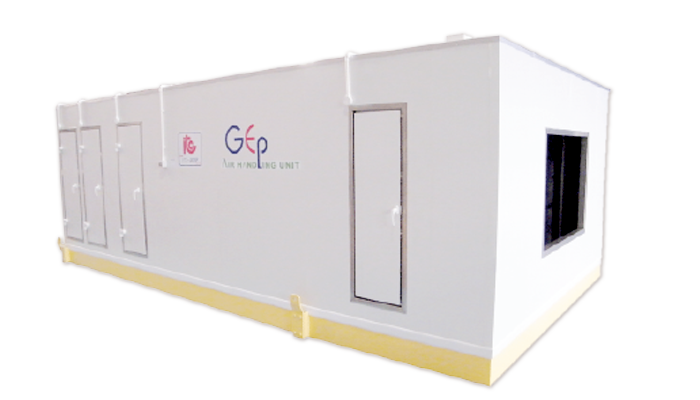 Air Handling Unit providing easy to access either by Walk-in or Reach-in concept with big round corner to meet the HACCP and GMP, regulation for Foods processing industry, with the GEP (Good engineering practice). All enclosure panel connection joint are air tight and the total floor is water tight. The enclosure will be foam by polyurethane insulator in various thickness to suit the working temperature and humidity. The Interior surface is stainless steel, Exterior enclosure will be white color bond sheet as standard. The best among the rest, ITC’s GEP-AHU is an elegant unit which meets all HACCP and GMP requirements, and it can provide better and higher quality standard in Industrial Air Conditioning System. This machine is assembled from various instruments including polyurethane insulation, interior stainless steel, external white color bond sheets (stainless option), filter systems and other accessorial devices. As a result, it has a very unique sturdy structure. Furthermore, ITC’s GEP-AHU has many distinct characteristics. For instance, its filter system can purify the ambient air which then will flow to the evaporator section. Here evaporators will decrease the air temperature and consequently will provide the fresh air with high O2 around the working field. Easy to walk in and reach in concept due to its convenient doors which is absolutely beneficial to services and maintenances. Meets the GMP’s and HACCP’s standards. Superb external hygienic color bond sheet structure. Extremely fresh cold air provided by the filter.